Medium bodied and immeasurably gentle, it offers up an abundance of juicy fruit and velvety, smooth tannins that lead to a sophisticated finish. Imagine the sensual pleasure of fresh, ripe, red strawberries combined with rose petals, marshmallows and the mystical aroma of cinnamon. The velvety smooth tannins of this medium bodied red wine blend are dominated by delicate Malbec notes blended with Cabernet Sauvignon and Cabernet Franc. The gentle balance of acidity gives this wine its unique character of being fresh, youthful and light. The flavours are playful and mischievous in the mouth with a lingering, lazy aftertaste. Non-vintage: Malbec, Cabernet Sauvignon and Cabernet Franc are carefully matured in third fill French oak barrels for twelve months. The Malbec is fermented without skin contact and aged in stainless steel tanks to retain the primary fruit aromas and freshness of the wine. De Toren is a boutique Private Cellar, established by Emil & Sonette Den Dulk in 1994. The farm was named De Toren, which translated from Dutch means "the tower", and refers to wine structure which allows for gravity-flow winemaking. The farm's maiden release was the 1999 vintage "Fusion V", a Cabernet Sauvignon driven five varietal Bordeaux style blend; a first for South Africa's wine industry. 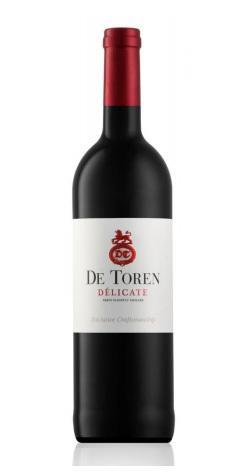 "De Toren doesn't have "a harvest" it has several micro-harvests over the course of many weeks; the time and location of each harvest is determined by near red aerial imagin. This technology allow us to monitor the vigor in clusters within each block, with different colours representing different growth patterns. When a cluster approaches ripeness we isolate demarcate and harvest separately; always at optimum ripeness. We are also able to identify variations within the vineyards with this technology that enables us to adapt our canopy management decisions...gaining valuable data and experience from each vintage and optimizing our harvests year on year - aiming for perfection!" From Anonymous of Boston, Massachusetts on 9/29/2017 . Full of ripe fruit, smooth and balanced. A great wine for this price point.